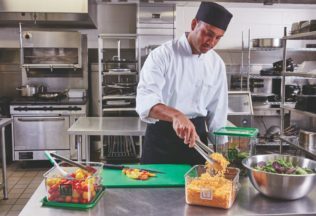 Rubbermaid has launched a new colour-coded foodservice system to help reduce foodborne illness and cross-contamination in commercial kitchens. The colour-coded line includes prep tools, storage, cutting boards, spatulas, tongs and other kitchen tools available in seven different colours . Each colour is designed to be used for a different category of food. Five different starter kits are available in the range. Alicia Fenwick, Senior Manager, Brand Marketing at Rubbermaid Commercial Products said contaminated food causes an estimated 4.1 million cases of foodborne illness a year in Australia. “With our new line of user-friendly products, we can help foodservice professionals maintain safer conditions at every stage of the preparation process, crucial for delivering quality service to patrons,” she said. The new line is available for purchase from Rubbermaid Commercial. A Cadbury chocolate range with Oreo biscuits is now available in Australian supermarkets. Buying fresh Australian vegetables is a long-term and cost-effective investment in your health.